More e-waste ends up in our landfills and incinerators than is being recycled, although recycling numbers continue to rise. Unfortunately, we don’t have a lot of solid data on e-waste recycling in the U.S.
“It is unclear whether the large increase in the electronics recycling rate from 2012 to 2013 is due to an actual increase in recycling or the result of improved and expanded data.” [Source is this report, page 69]. 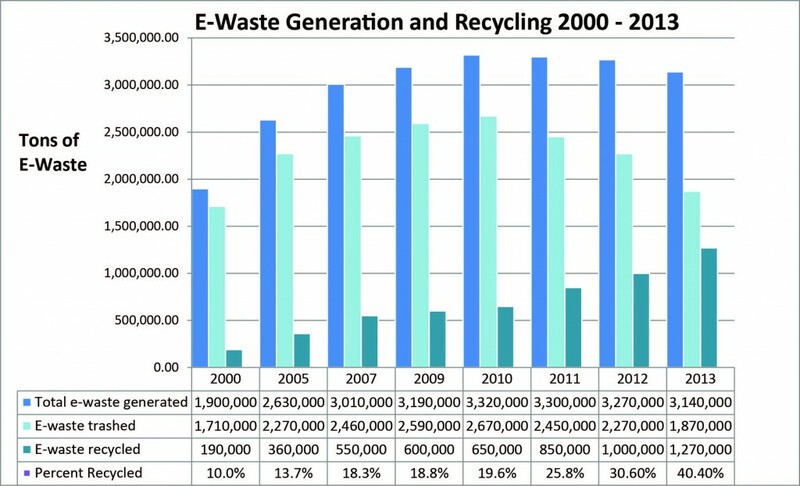 We are also suspicious of data showing that the volume of e-waste being generated is decreasing. Certainly the weight of what we are buying is decreasing, as many products get thinner and lighter. But with the huge increase in volumes of products we are buying and retiring, we’d be surprised if these numbers (of e-waste generated, meaning e-waste ready to be trashed or recycled) are going down already. But we don’t doubt that e-waste recycling volumes are increasing, primarily as the result of many state laws requiring e-waste recycling, as well as some of the manufacturers’ voluntary programs. And while recycling is increasing, according to the EPA, currently about 60% of discarded electronics end up in the trash. While many states are passing laws to prevent e-waste from going into their landfills and incinerators, it’s still legal to trash electronics in many states. This is problematic because the hazardous chemicals in them them could leach out of landfills into groundwater and streams. Burning the plastics in electronics can emit dioxin. Out of 3.14 tons of e-waste generated in the U.S. in 2013, 1.87 million tons went into landfills and incinerators (60%) and only 1.27 million tons (40%) was recovered for recycling. However, a significant amount of that 40% was exported. This data comes from an EPA report called “Advancing Sustainable Materials Management. Facts and Figures 2013.” This report tracks waste generation and recycling of a wide variety of products and materials from residences and commercial establishments such as businesses and institutions. The data above is from the category in the report called “Selected Consumer Electronics” which includes TVs, VCRs, DVD players, video cameras, stereo systems, telephones, and computer equipment, but not all categories of electronics. What states have laws that keep e-waste out of the trash?